As an instructor with Northwestern University's Ready, Set, Go (RSG) program, Byron had the opportunity to observe and meet the Alan Alda Center for Communicating Science (CCS) team at the University of Chicago this month. Northwestern's RSG program is based on the CCS program both with the goal of applying improv and theatre techniques to help improve the communication skills of scientists. 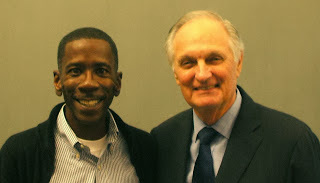 It was also Great to meet with actor Alan Alda and watch him work. Alda doing improv! under the direction of Katie Watson, Northwestern University. Byron the led improv games; Attacker-Defender, Conducted Story, Doctor Know it All, New Choice, and Freeze Tag. Our goal was to show the clinician participants that the rules and games of improv can help when addressing diagnostic errors in medicine. It worked!